I had a feeling this might be an auspicious day when I walked out of our front gate this morning and intercepted a small procession consisting of men with cymbals and a drum, a man with offerings suspended from a bamboo pole over his shoulder, others with offerings on brass platters and a man leading a large black goat. I guessed that I would not see the goat again standing on his own four feet. 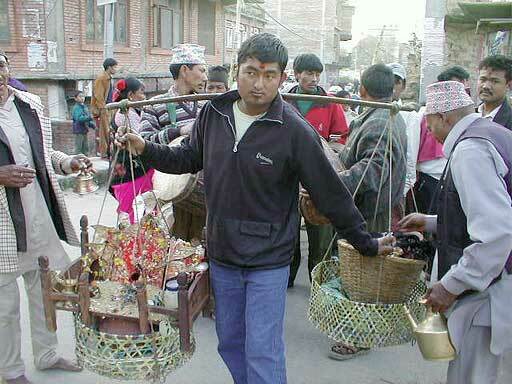 Important ceremonies and festivals in Nepal are set according to the numerical calendar (Democracy Day), the lunar calendar (Tibetan New Year) or auspicious days as identified by astrologers (weddings and string ceremonies). 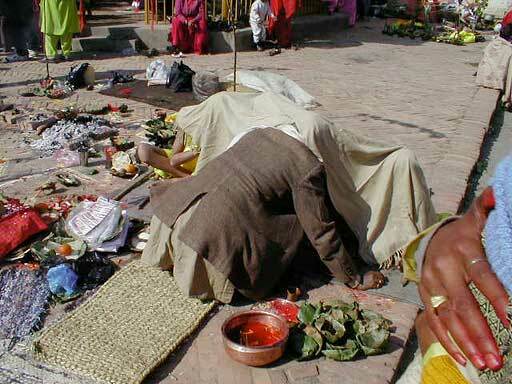 As far as I can tell, it is impossible for westerners to foretell an auspicious day until it is upon us. 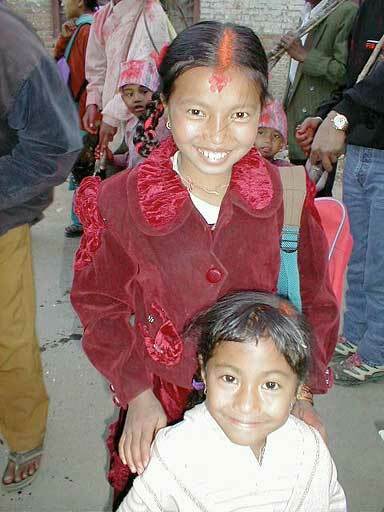 I followed the men and the black goat for a while and then continued my hour and a half walk to the Kumbeshwor Technical School (http://www.geocities.com/kumbeshwor2000), where I hoped to finish English editing the annual report in time to play with the nursery school kids. When I arrived at the ancient five tiered temple across from KTS, the courtyard around the temple was a beehive of activity. 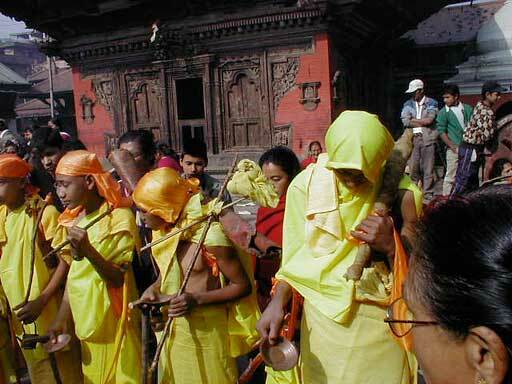 Three string ceremonies were in progress, including one with twenty boys whose families had migrated to Kathmandu from the village of Palpa (photo a). 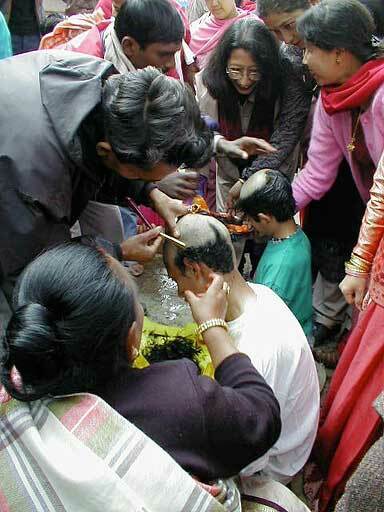 The string ceremony marks the initiation into manhood, even though one boy from Palpa was only five years old (photo b). More properly the ceremony is called Bratabanda or Chudakarma, literally shaving head karma. The ceremony begins with, you guessed it, the boys having their heads shaved except for a tiny tail on top that is tied with rings and sometimes jewels (photo c). 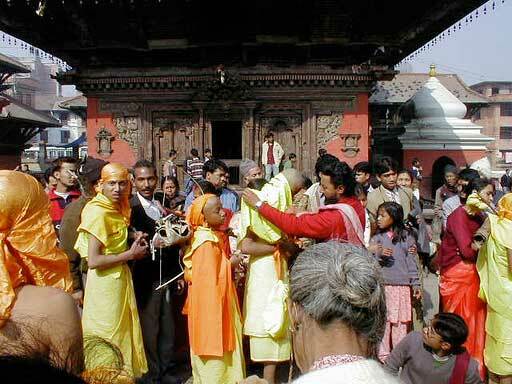 The boys at the Kumbeshwor Temple were all wrapped in bright orange or yellow garb for rituals that last up to five hours (photo d). A priest instructs the boys in the lessons of manhood and gives each his own mantra shrouded in secret (photo e). 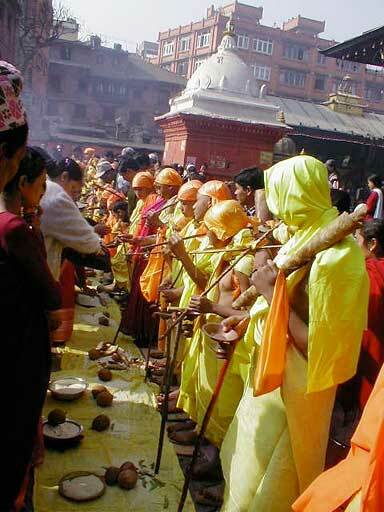 There is much burning of incense, tossing of rice, dousing with vermilion powder and making of offerings. Each boy has a staff, a stick slung with bags of grain to feed him on his journey into manhood, a toy-like bow to protect himself from wild animals and a skin, preferably a deer skin, to sleep on as he journeys through the forest (photo f and photo g - note deer feet in g). The boys take a symbolic journey, walking with their possessions around the ritual offerings laid out in front of them (photo h). 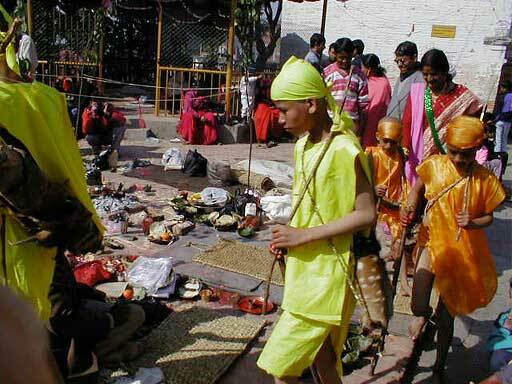 The beautifully dressed women of the family make offerings of food to the boys to sustain them on their journey. 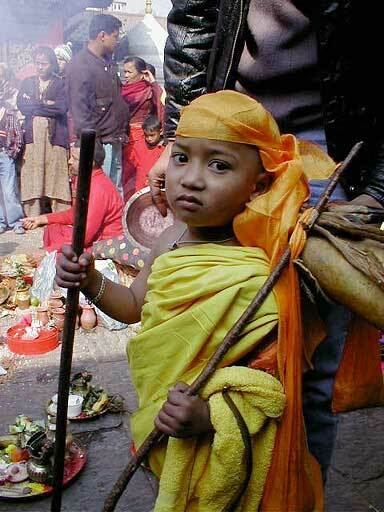 At the end, a cotton string is looped over the boy's shoulder, signifying that he is now a man, even if he is only five. A Brahman man observing the festivities proudly told me that Brahman strings, such as the one he was wearing under his shirt, had six strands, whereas other castes had only three or four. The event ends with each boy in turn breaking away and being pursued by an uncle. Supposedly, only if the boy is caught will he return to live with the family. As far as I could tell, they all got caught. When I got home in the late afternoon (having passed on the way a cremation in progress by the river), I encountered three string ceremony processions passing our house. 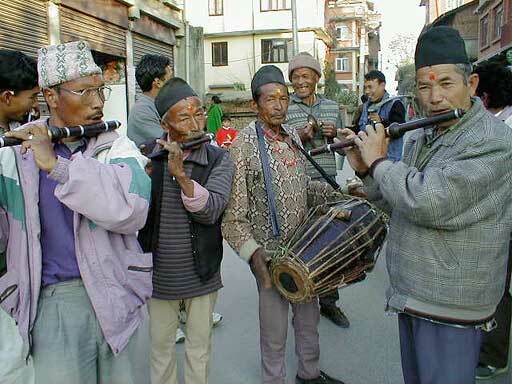 Each was led by a band of one sort or another (photo i). 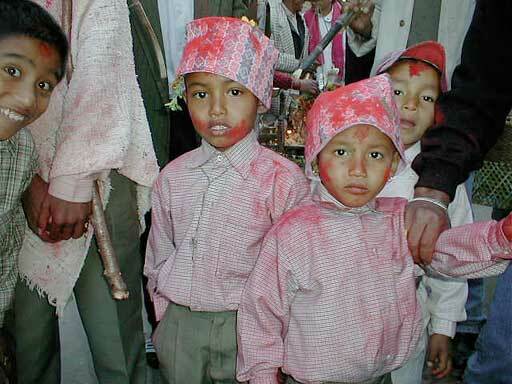 In this case the boys wore street clothes and a traditional Nepali man's hat, a local variation reflecting our Newari neighborhood (photo j). As the processions moved through the neighborhood, women came out of the houses with giant brass bowls of rice and fruit to give to the boys to bless their journey into manhood. The neighborhood vibrated with joy as everyone joined the celebration (photo k). 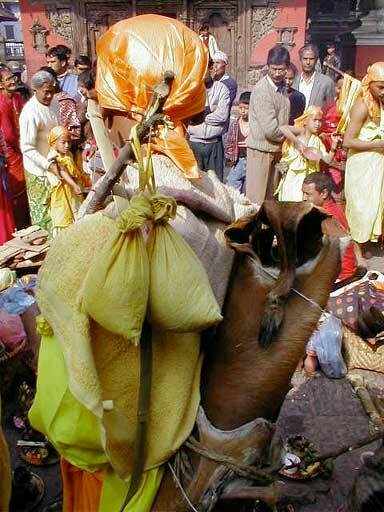 In one procession, a man was carrying offerings, including the head of a large black goat (photo l). We wish all of you an auspicious day.